Epson printers with ink tanks are excellent but if we closed the key to the ink, this will cause major problems in the quality and performance of the printer. Here's a double-edged sword for those who do not know their importance and influence in the Epson printers ink tanks. Believe it or not, but such an instrument as transport blockade which incidentally is the name given by the manufacturer, can damage the printer. I have daily receive many comments from people who have a printer with ink tanks, but this does not print or blurry printing. Like shown in the picture at the beginning of this publication, will be open up and shut down, but that will happen if we closed while we're trying to print. Maybe nothing will happen only if we at least about 100 pages, but if we see the need to print at least 500 or more pages, with the lock closed transport, definitely we will damage the printer. Whenever we are trying to print, this lock must be fully open up. This will prevent damage to the printhead. The ink serves to dissipate heat that has to work printhead for ejecting the ink, if not on time to the head while printing, first heating receive an error, then it will be a time and printer cool and for the next time it stops we will have nothing more to find. When you have a printer is printing a little clear even before a head cleaning is recommended to check if the key is closed or open. 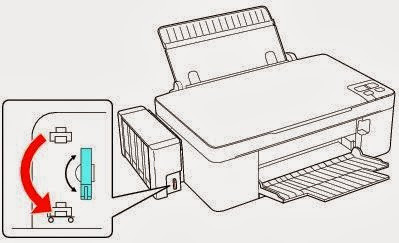 Do not forget when you finish moving the printer, if necessary, put again the transport lock in place and do a thorough cleaning head for Epson printer, this will help put the printheads on its place again.